Interested in Mickey’s Not-So-Scary Halloween Party? Then this is the place for you! 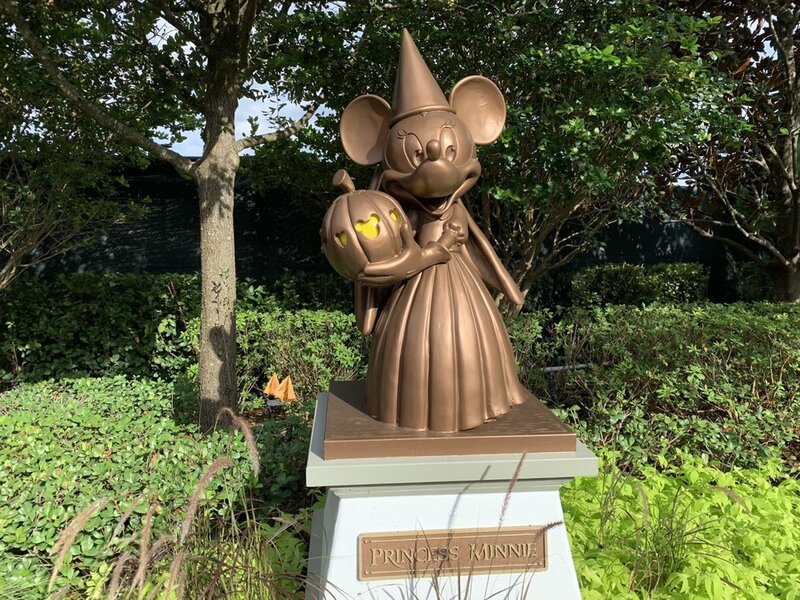 In our combined review and guide, we’ll cover everything you need to know about Mickey’s Not-So-Scary Halloween Party, the flagship Halloween season event at Walt Disney World’s Magic Kingdom, including planning for the 2019 event! Mickey’s Not-So-Scary Halloween Party is a ticketed event that happens on select nights (listed below) between August and October at the Magic Kingdom. The party takes over the entire park after it is closed to non-ticketed guests. The party hours are 7PM to 12AM, but party guests can arrive as early as 4PM. The last show is at 12AM, and you can hang around and shop for a bit after that. Mickey’s Not-So-Scary Halloween Party offers unique character greetings, Halloween-inspired ride overlays, unique food items, trick-or-treating, unique shows, and a special “Boo-To-You” Halloween Parade. We cover all these items in this guide. The event is offered somewhere around two to four times a week. The 2019 dates are: August 16, 20, 23, 27 and 30; September 2, 6, 8, 10, 13, 15, 17, 20, 22, 24, 27 and 29; October 1, 3, 4, 6, 8, 10, 11, 14, 15, 17, 18, 20, 21, 24, 25, 27, 29 and 31; November 1. Prices vary by party date and start at (pre-tax) $74 for kids / $79 for adults and go up to $130 kids / $135 adults. You can buy tickets directly through Disney or through Undercover Tourist. Disney offers Annual Passholder and Disney Vacation Club discounts on party tickets. FastPass+ is not available during party hours (7PM to 12AM). 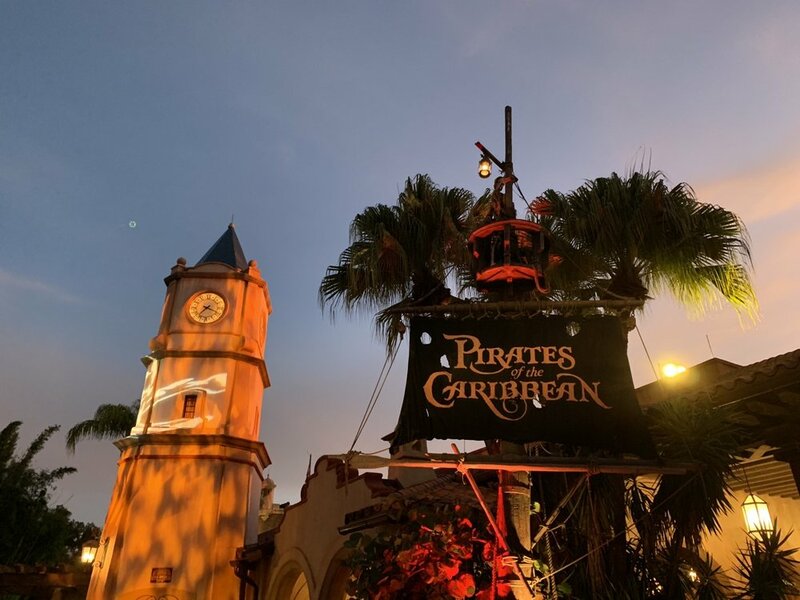 Sources are split on whether you can book FastPass+ reservations with only a party ticket for the three early hours from 4PM to 7PM when party guests are allowed in the party (more on this below). Let us know if you’re able to do this! A special combined map and times guide is provided for Mickey’s Not-So-Scary Halloween Party. You should check all times and information in this guide against the guide you get when you arrive at the party! Mickey’s Not-So-Scary Halloween Party is one of the few times Disney openly encourages everyone, including adults, to wear costumes. There are a few regulations to know, though. The Disney website lists some key rules, but you should remember that Disney Cast Members will always have the final say on your costume. If you’re at all in doubt as to whether your costume is appropriate, err on the side of caution! We didn’t wear costumes, and we’d guess about 50% of adults were in costume. Most everyone had some sort of Halloween gear, and those who didn’t usually just paid $16 for a light-up pumpkin or Jack Skellington necklace. It’s easy to forget that adults aren’t regularly. allowed to dress up as characters at Disney parks. So if you’ve been holding onto a costume idea, now the Halloween party is your chance to break it out! If you’re not the costume type, don’t worry, you won’t stick out like a sore thumb. Remember, you need a special event ticket to enjoy Mickey’s Not-So-Scary Halloween Party. The park technically closes to non-event guests at 6PM. This means if you’re visiting Magic Kingdom on a party day with just a regular ticket, you’ll have a very abbreviated day. Cast Members distinguish identify event guests by their special Mickey’s Not-So-Scary Halloween Party wristbands. The events are scheduled to start at 7PM every night of the party. While Disney doesn’t openly post it, party guests can arrive as early as 4PM. Just as non-event guests cannot hang out after 6PM, event guests will not be admitted before 4PM. When we arrived around 4:30PM, most of the entry queues were dedicated to party guests. Party guests who arrive after 4PM are shepherded through dedicated queues and directed directly to get wristbands for the evening. If you have a non-party ticket (or are an annual passholder) for the day and also have a party ticket you are welcome to visit Magic Kingdom all day. In that case, you’ll see different spots marked “Wristband Distribution” where you can scan your ticket and grab your wristband. There are fourteen trick or treat locations on the Mickey’s Not-So-Scary Halloween Party map. You might find Cast Members handing out treats at a few other spots, too. Trick-or-treating is ongoing from 7PM to 12AM. Almost all of these locations are handing out standard Mars / Wrigley treats (lots of chocolate, some Skittles / Starburst). There are also two allergy-friendly spots, and the map indicates you can ask for an allergy-friendly bag at any treat stop. These trick-or-treat spots are in-and-out situations. You get in a queue, walk up to a Cast Member standing next to a bucket of treats, the Cast Member drops a handful in your bag, you say thank you, you exit. The queues move quickly and tend to have multiple buckets in case someone holds up on insisting the Cast Member dig for a specific treat. While trick-or-treating is a cornerstone of the Mickey’s Not-So-Scary Halloween Party experience, it’s also a pretty big waste of time. You’re not getting amazing candy, and there’s no special element to it (something like characters handing out candy would be cool). There are about 20 character appearances at Mickey’s Not-So-Scary Halloween Party. These are really a boom-and-bust situation. There are (allegedly) three-hour waits some nights for popular characters like Jack and Sally or “Elvis” Stitch. Realistically, for these most popular characters you do need to plan to arrive early and count on an hour wait. Characters are present from 7PM (or earlier for select characters) to 12AM, but their lines may close earlier than that. There are many characters with much shorter waits. We met Minnie on a 15-minute wait that could have been five if not for some very slow groups. Everyone wants their special Halloween photos with characters, but try to be reasonable! If you’re interested in them, character appearances are going to take a big chunk of your time. We’d suggest putting the ride overlays on the backburner and planning to visit the 12AM Hocus Pocus show to carve out some time if you’ve got a long character list. In 2019, overlays will be offered at PeopleMover, Monsters Inc. Laugh Floor, and Big Thunder Mountain Railroad. Details on these are not yet available (but we’ll be updating after we visit the first party). In 2018, Mickey’s Not-So-Scary Halloween Party featured three unique ride overlays. Rides are operational until 12AM. This “overlay” was underwhelming for having so much potential. It consists of three live characters added to the ride experience, two in the queue and one on the ride. It’s fun to see something a little different, and we got a kick out of the two in the queue. It was a little disappointing for a ride with so much spooky potential, though. We waited about 15 minutes when doors opened at 7PM. The Space Mountain overlay is two simple changes. First, the ride lights are turned off, setting the ride in an almost pitch black environment. Second, the music is replaced with rock music, creating a more intense experience. This was our favorite of the overlays. Even though they can’t get the inside of Space Mountain completely black, it’s noticeably darker than the standard ride, and it makes for a very exciting experience. Waits were 25-35 minutes much of the night. If you hop on later, you’ll snag a shorter wait. 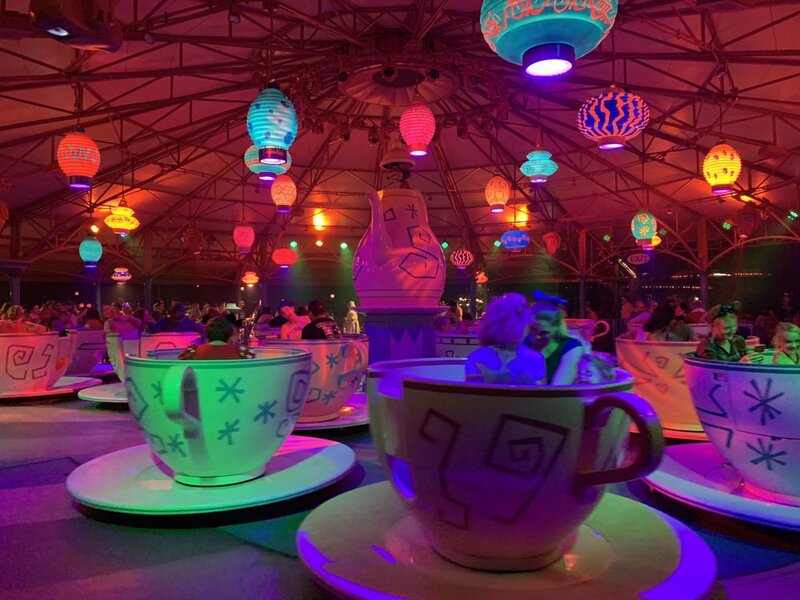 The Mad Tea Party overlay consists of Halloween music and lighting. The Scream-O-Ween Ball is one of two dance parties that take place for the entire duration of Mickey’s Not-So-Scary Halloween Party. There’s really not much to this, there’s a DJ, simple lighting effects, and characters from Monsters, Inc. dancing along. The Ball takes place at the RocketTower Plaza Stage in Tomorrowland. You’ll inevitably pass by it at some point during its operation from 7PM to 12AM. The other dance party that takes place during Mickey’s Not-So-Scary Halloween Party is the Storybook Circus Disney Junior Jam. This one is really easy to miss as it’s buried all the way in the back of Storybook Circus. It’s the same concept as the Scream-O-Ween Ball but with Disney Junior Characters. Again, the Jam is ongoing from 7PM to 12AM. The Hocus Pocus Villain Spelltacular was easily our favorite part of the Mickey’s Not-So-Scary Halloween Party. This is a villain-centric performance with a plot driven by the Sanderson Sisters from the amazing Disney film Hocus Pocus. It is shown four times at 7:40PM, 8:35PM, 10:45PM, and 12AM. We liked this show so much we watched it twice! If you watch the 12AM showing, you should be able to get a great view as late as 11:45PM. We were just a few rows from the front during out second viewing. If you or your kids haven’t seen Hocus Pocus, bookmark this post and go figure out how you’ll see it ASAP (and definitely before the Halloween Party)! We watched it at All-Star Music the night before the party, and it’s also frequently on Freeform. It will also be in select AMC theaters on select dates this year. If you’re heading to the party in an hour and haven’t seen Hocus Pocus, fear not, you won’t miss out. You don’t need background knowledge to enjoy the Sanderson Sisters, and there are plenty of other villains involved in the story that you and your kids will love. We’d skip the 7:40PM showing in favor of a Character Appearance or ride and then catch the 8:35PM so you still have two more chances if you’d like to watch it twice. The feature parade of Mickey’s Not-So-Scary Halloween Party is Mickey’s “Boo-To-You” Halloween Parade. This parade features unique halloween-themed floats and appearances from rarely-seen characters like the Gravediggers and Hitchhiking ghosts. The parade occurs twice, at 9:15PM and 11:15PM. More esteemed commentators than us suggest seeing the 9:15PM parade because it’s so good you might want to see it twice. While we definitely favor seeing the 9:15PM showing (right between Hocus Pocus and the firework show), we actually weren’t super impressed by the parade. While it has a catchy tune and some awesome moments (the Gravediggers and the Headless Horseman), we were overall underwhelmed by the floats. We also found it to be a bit short. It comes in around 13 - 14 minutes, while Festival of Fantasy, Magic Kingdom’s feature parade during the day, comes in at 15 - 17 minutes. It was tough to get a great spot for the first showing, but the second showing was much easier, especially around Frontierland. The route follows the standard Magic Kingdom parade route and is indicated on the Mickey’s Not-So-Scary Halloween Party map. Plan to see the 9:15PM parade, especially because you might love it more than us and want to see the second showing. Just hang out around the middle of the park following the 8:35PM showing of Hocus Pocus Villain Spelltacular. 2019 will see a new once-a-night firework show at Mickey’s Not-So-Scary Halloween Party. This is the only once-a-night show on the schedule, so be sure to plan to see it! At our visit, it was at 10:15PM, but you should obviously confirm the time when you arrive. We wrote last year about how much we loved Hallowishes for its old-school firework-heavy design. The new show will obviously feature projections more heavily, but we’re optimistic Disney will produce a fantastic show. And we’ll be at its debut to let you know! There is a wide range of food and merchandise items that are available specifically during Mickey’s Not-So-Scary Halloween Party. The Disney Parks Blog has a great rundown of the special food options available at the party. Keep in mind, though, that there is no chance at all that your food item will look as good as the photos the official parks blog was able to get. As for merchandise, this was one of the areas we were really pleasantly surprised. We were actually quite disappointed at the overall Halloween lineup of merchandise at Magic Kingdom. The party merchandise, however, was much more impressive. Obviously Disney wants to save its best gear for people already willing to drop $$$ on the party. While you can get Haunted Mansion and Nightmare Before Christmas themed merchandise at any time, Mickey’s Not-So-Scary Halloween Party is the only time you’ll get Hocus Pocus merchandise. Merchandise lines are going to be longest following the fireworks. Earlier in the party, we were able to walk through the stores with almost no one else, and the exclusive merchandise sections were empty except for us. During Mickey’s Not-So-Scary Halloween Party, only about 50% of Magic Kingdom’s attractions are operational, but the majority of the rides are operational. You can see the list on the map & times guide posted near the beginning of this post. Honestly, the party is not a good time to ride rides. With the exception of the above-mentioned overlays, the rides are the same as they are outside the party. It’s just not a good use of your time to be waiting in lines for these rides. Walking around the park to enjoy event-specific decorations, music, and lighting is a far better use of your time (seriously). A fair number of dining options remain open for the party, as well. These include stops like Casey’s Corner, Cosmic Ray’s, and Pecos Bill. While Disney widely advertises that Mobile Ordering remains active during the party, we had no such luck. Want to know more about Disney’s Holiday Events? We’ve got a guide to the upcoming Mickey’s Very Merry Christmas Party, too!